Sealaska Heritage Institute (SHI) has acquired a spruce-root hat made by master Haida weaver Delores Churchill that is a near replica of one found with ancient remains of an indigenous man discovered in a melting glacier in 1999. 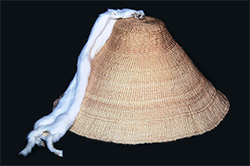 The hat includes a weaving technique called a six-strand ending that had been lost until Churchill studied the ancient hat through a sponsorship from SHI and rediscovered it. The purchase, which was made possible through the support of the Rasmuson Foundation Art Acquisition Fund, will allow students to study the old weaving technique, said SHI President Rosita Worl. “Delores was able to reintroduce an indigenous weaving technique that had become extinct and hadn’t been seen for hundreds of years. The technique can now be studied through the new hat by contemporary Alaska Native artists to stimulate new creations and artistic expressions,” Worl said. The old hat was found in a melting glacier in British Columbia near human remains of a man who lived approximately 570 to 620 years ago. Tribes gave him the name Kwaday Dan Ts’inchi (“Long Ago Person Found” in Tutchone, a First Nations language). SHI and the Champagne and Aishihik First Nations (CAFN) sponsored a program to test 250 Native people for DNA matches, and the DNA results showed 9 people from Alaska and 8 people from Canada are related to Kwaday Dan Ts’inchi. In 2001, SHI asked Churchill, who shares the same mitochondrial DNA genetic markers as Kwaday Dan Ts'inchi, to conduct a detailed analysis of the hat, which is kept in an archival facility in Whitehorse, YT, and is not widely accessible. It was through that study that she rediscovered the extremely complicated edge known as the six-strand ending. Although similar to the ancient hat, Churchill’s weaving incorporates a small change with the attachment of a white ermine pelt to the crown. The hat is a masterpiece of complex design, employing a double weave technique, in which the hat is formed by an interior and exterior wall seamlessly woven together, and edged with the six-strand ending. In order to construct the hat, Churchill had to reverse engineer and reinvent the necessary stitches. A versatile and highly-skilled artist, Delores Churchill is an eminent Haida weaver who is an expert in gathering and preparing materials for cedar bark, spruce root, and Chilkat weaving. Churchill’s weavings are exhibited in museums throughout the world. Born in Masset on Haida Gwaii, Churchill was taught to weave by her mother, Selina Peratrovich, as well as masters Flora Matthew and Brenda White. A Northwest Coast Native of Haida descent, Churchill has dedicated her life to revitalizing traditional basket weaving in Tlingit, Haida, and Tsimshian styles. For many years, Churchill, a resident of Ketchikan, has taught basketry and basket design at the University of Alaska Southeast, across the United States, and in Europe. She regularly teaches weaving and spruce root collecting in communities through Southeast Alaska and northern British Columbia. She also teaches weaving for SHI on a regular basis and was instrumental in reintroducing spruce-root basketry in Hoonah through one of the institute’s programs. Additionally, the Walter Soboleff Building’s artist-in-residence space is named for her. Caption: Spruce-root hat made in 2017 by Delores Churchill and acquired by SHI.